A common question we get asked around here is, “What size rubber bracelet should I order?” This is an important query, since a bracelet that doesn’t fit well doesn’t get worn. Youth: 7″ around, our youth bands are recommended for kids 6-12. These are great for pre-high school groups such as youth baseball teams and girl scout troops. Adult: 8″ around, this is our universal size. 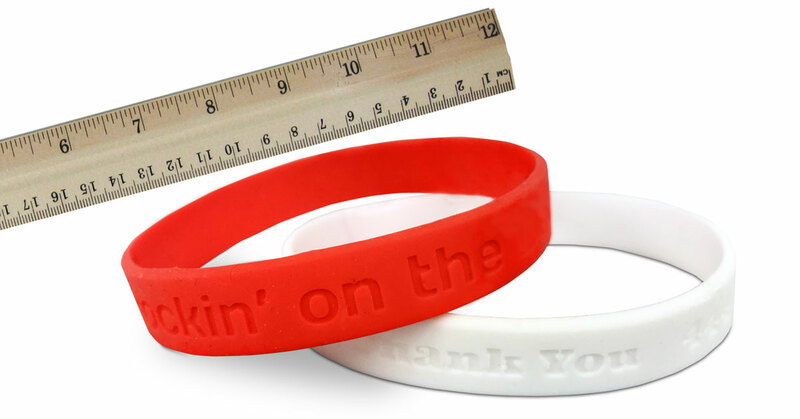 Most projects order wristbands in this size as it will fit the widest range of people. Large: 8.5″ around, this is our large-sized wristband. Good for your college football team or other group with a large average wrist size. A question to ask yourself is: Is this a wristband campaign for middle school children or are I targeting NFL football fans? My point here is simple: the people matter. In general the above sizes should be appropriate. If you happen to be ordering wristbands for the Steroid Users Of America or the Butter Is Better Official Fan Group, you may need to adjust upward a peg. And the same goes in the other direction. If you’re placing an order on behalf of the “I Can Fit Through Tiny Cracks” Facebook Group, maybe size down a notch. A little bit of noggin’ power is advised to assure the best results.